Click to read more about the Prynne Family. Standing facing the nave altar, the 15th century south aisle is on your right. 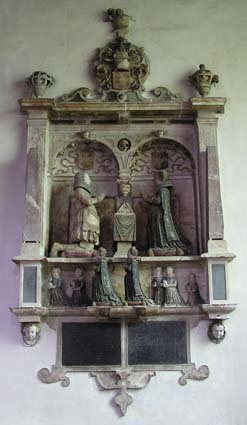 It houses one of the church’s greatest treasures – the monument to Sir Gilbert Prynne and his wife. The monument was originally erected in 1628 when it stood in the south chancel chapel (now the Lady Chapel) where it blocked the westernmost window. Fortunately, it was moved from there to its present position against the south aisle wall during the major restoration and rebuilding of the church in 1875-78. This monument has been considerably improved by the cleaning and restoration carried out in 1981. The figures and the brass tablets below the monument are worth inspecting. Five of the seven children depicted are shown carrying skulls. This signifies that they died in infancy. To the right of the Prynne Monument is a group of 17th and 18th century memorial tablets (28-31), of which there are many examples in the church. To the left is a late 19th century memorial window. This was made by Lavers and Westlake of London who were responsible for many of the stained glass windows here. This particular window shows the Annunciation, Visitation, the Nativity and the Adoration of the Magi. Further along the wall of the south aisle are two Stations of the Cross. Stations of the Cross are sequential points of focus in the church for penitential worship during the period of Lent prior to Good Friday. They represent steps in the Passion narrative leading to Christ’s crucifixion. In Roman Catholic places of worship there are often as many as fourteen Stations. From west to east, these are: (5) Jesus is stripped; (6) Jesus is nailed to the cross. The other four permanently visible stations are on the wall of the north aisle. Further east along the south aisle, between the baptistry and the Lady Chapel, is another 19th century stained glass window by Lavers and Westlake. This shows the Dedication of Samuel in the Temple, Christ disputing with the doctors, Christ working in St. Joseph’s workshop, and Christ blessing the children. Below this window stands the Mayor’s chair, emblazoned with the Borough coat of arms. This coat of arms was first used as a Borough Seal in 1359 and is a combination of the escutcheons (shields with armorial bearings) of the Gascelyns and Hussees who were Lords of the Manors of nearby Sheldon and Rowden respectively in the 13th and 14th centuries. The connection between the Borough and this church has always been a close one and, each year, the Civic Service for the Mayor and Town Council is held here.